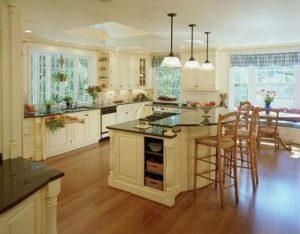 Newer home remodels shows, such as Fixer Upper and Property Brothers mixed with old favorites, such as This Old House, have shown people how much their home space can be transformed by a home makeover. While you might not be ready to commit to remodeling your entire home, there are five remodel projects to consider if you want to make some smaller but significant changes to your home. According to a recent Bobvila article, a kitchen makeover is one of the “10 Decisions Homeowners Never Regret.” When it comes to the kitchen, there are many options for a remodel. Often, a good place to start is with new appliances. You may also want to replace old countertops and cupboards. In some cases, adding additional counter space or cupboards is a great idea. Adding or expanding an island is a great way to add more counter space. Additional cupboard space sometimes requires removing a wall or otherwise creating a larger kitchen. One complaint some people have about their kitchen space is that it is dark or bland. New flooring and a new paint color can sometimes resolve this issue. New lighting or a large window can also help to make a dark kitchen feel brighter. Plus, if your kitchen is small and expanding it is not an option, the right paint colors and increased natural lighting can make it feel bigger and often more welcoming. While any bedroom in a home is a potential remodel project, the master bedroom is a popular choice. If your master bedroom is too small, there are two ways to increase the space. One way is to expand into your current indoor space. If you do not need a neighboring bedroom, you may want to knock out the wall and increase the size of the master bedroom by making the two bedrooms into one. If you are not ready to sacrifice a whole bedroom, you could expand the master bedroom partway into a neighboring room or other areas. In some cases, sacrificing part of a walk-in closet for bedroom space is a good option. If expanding into your current home area is not possible, a second option is to have an addition built onto your home. In some cases, building a whole new master bedroom on the back of the house and making the current master bedroom into a guest bedroom is the best option. If your bedroom’s current size is fine but your room needs a makeover, there are several options you may want to consider. New flooring, new paint, and new lighting can really transform a bedroom. You may also want to consider new windows, especially if energy-efficiency is a problem or if you want larger windows, which will bring in the more natural light. A bathroom remodel is often a great idea. You may want to replace the floors and change out the sink, toilet, shower, and tub for new ones. Newly tiled bathroom walls, particularly in the bathtub or shower are often a beautiful addition to a remodeled bathroom. Sometimes a bathroom remodel is about making the space more functional. If your current bathroom vanity only has one sink, you may want to expand it to two sinks, especially in the master bathroom. Replacing a bathtub or cramped shower with a spacious shower sometimes makes a bathroom more luxurious and functional. If the bathroom is going to be used by young children, replacing a shower with a bathtub or a bath/shower combo will likely make the space more useful. Making one bathroom into two may also be worth considering, especially if you have a bathroom that can be divided without making it feel cramped. In some cases, most of the space can stay with the current bathroom, and the other space can be converted into simply a toilet and sink or a bathroom with a toilet, sink, and smaller shower. Like many of the other rooms in your house, new flooring, paint, and light fixtures are often good starts to a family room remodel. Bigger windows or more windows as well as sliding glass doors that lead to your backyard are options to consider if you want more natural lighting and an easy transition between your indoor and outdoor entertaining space. If you do a lot of entertaining in your family room, you may also want to consider adding a bar area or other space where people can sit down to enjoy food and beverages. Built-in shelving for books, video games, movies, and other items may also be a good idea. Along with built-in shelving, you may want to consider built-in cabinets or drawers, where the kids’ toys and other items can be placed to keep your family room floor from looking cluttered. If watching movies with your family or friends is a favorite pastime, you may want to create a media wall in your family room, where the wall is created specifically to accommodate your television. You may even want to transform your family room into a media room, complete with movie theater seating. Many of these homes remodel projects will require knocking out a wall or two. In some cases, simply knocking out a couple of walls can do wonders for changing the way your home flows. This is a great idea if you want an open floor plan where the kitchen, dining room, and living room all flow together. Knocking out walls often gives all the rooms extra space. It can also create extra space in an entryway or in other areas of your home. Of course, there are many other homes remodel project options to transform your home. To make sure your home remodel project is completed correctly, you will want to hire experienced home remodeling contractors. If you are looking for a knowledgeable company to handle your next home remodel, contact us. Even if you do not know exactly how you want your home remodeled, do not worry. We will work with you to help you create your ideal space, offering you some ideas of what will work best for you.